Be Responsive: Choosing a responsive framework is the need of the hour and Bootstrap is a popular option for the website developers. No matter how the users are approaching your website (via desktop, smartphone or tablet), a responsive technique will let them have a similar experience. It has SEO benefits, could be easily managed and you need not have to separate the mobile URL. Think with your Index Finger or Thumb: The site should be completely navigable using the index finger or the thumb. Users should be able to browse your site with their ‘phone hand’ only. In addition, the font size should be optimized so that the users need not pinch it to zoom in. Keep a Simple Design: The short attention span of net users is notoriously famous and uninterrupted attention span is just 1.0 second. Thus, it is better to keep a clean and simple design and web content, which can instantaneously convey the core message. Keep a Short and Attractive Web Content: The main thing is to present your story in minimum words and in an interesting manner. To engage the users’ attention, add only the essential copies to keep them engaged till the last sentence. Focus on the Icon Design: Keep your site uncluttered and instead of using words, use conventional mobile icons to convey the instruction messages like ‘to make a call’ or ‘connect socially’. Easy Access to your Contact Info: Objective of a mobile website should be clearly portrayed at your site. For example, when you are running your business from multiple locations, your priority should be to provide the users with the addresses of your multiple stores; its opening and closing hours; booking or contact numbers and nearest location of the business. Wise Addition of Videos: It is a good practice to add videos to mobile websites. This is because the mobile device users are 3 times more likely to watch video clips in general. The video player must support HTML5 version so that the clips would run on most of the devices. Mobile Friendly Form Designs: Best practices of HTML and CSS will help you to make your contact form mobile friendly. CSS styling allows for sufficient wiggle room around the form input fields and helps design button elements which are finger friendly for smart phone users. The different attributes of HTML5 aids in mobile user experience. For example, the placeholder attribute guides the user as to the kind of data that must be filled in the form. HTML5 comes with autocorrect and autocapitalize features that help to capitalize the data in the form entry field. Additionally, HTML5 form features are supported by different browsers used in Andriod phones and iOS Safari. Using these simple HTML and CSS codes can help to design mobile friendly forms for websites optimized for the mobile experience. You can compensate the number of form fields with the inbuilt technology of mobile devices. For example, as GPS is easily accessible through a mobile device, it is useless to ask for the city or state name and the ZIP code. 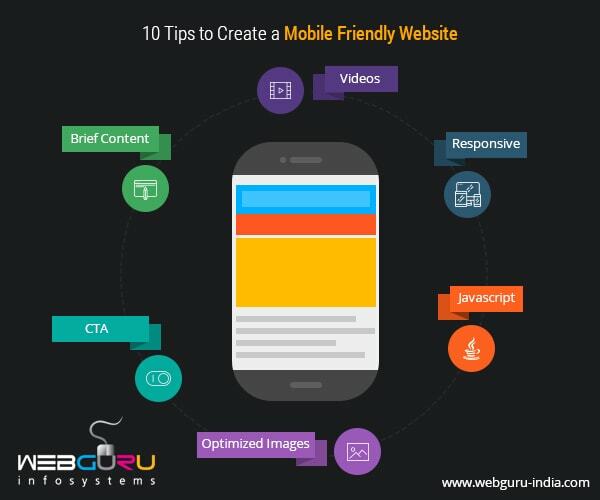 Keeping in mind the aforementioned 10 tips, you can develop a wonderful mobile-friendly website. However, you can add more features to enhance the user experience. Good to read this detailed blog on mobile-friendly websites! We use these features regularly yet fail to notice them. Great article shared. Keep posting. Thanks for such a great post you have share here. Keep updating. Hi, Great post, Nowadays mobile friendly websites are in trend and every user wants platform independent websites which are flexible user-friendly.Thanks for sharing this post it is useful for website developers. Thanks for such amazing article, Now-a-days Mobile responsive website is very good way to get more traffic on a website. because more user use mobile phone for suffering and searching. Thanks for sharing your responsive suggestion. These are benefit for us. I am looking for the mobile friendly website. Really, you have solved my problem. Thanks!! It is important to have a mobile version of the website. In 2017, mobile website speed will be a decisive factor for ranking websites that prioritize. I am happy to read your blog. Good tips for making a mobile friendly website. A responsive website is now trending. Today responsive website is very important because most users use mobile or tablet. If your website is not mobile friendly then users will leave your website. so thanks for sharing this informative article.